Given the sheer amount of torque and power needed to propel a car that weighs thousands of pounds, you’d think that parts made from plastic would disintegrate in minutes. But researchers have developed a plastic gear reinforced with carbon fiber that’s strong enough to actually be used as a replacement for metal parts in a vehicle. 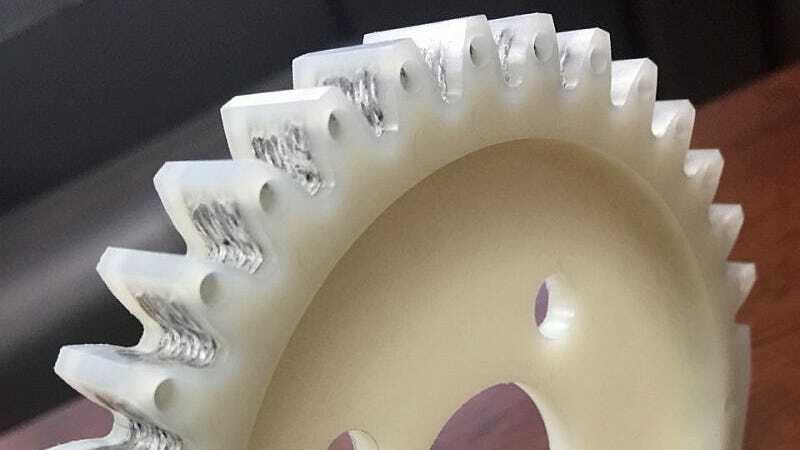 When a gear is spinning against another gear, the vast majority of the forces are exerted where the teeth actually connect to the gear’s core. So researchers at Japan’s Gifu University and a company called Central Fine Tool added a thin layer of carbon fiber running through each tooth that adequately reinforces and strengthens the part. Because carbon fiber is used sparingly in the part, the new gears are easier and cheaper to produce than their metal counterparts. And because they’re not made from metal, they’re considerably lighter which in turn makes the vehicle lighter and improves its fuel efficiency.